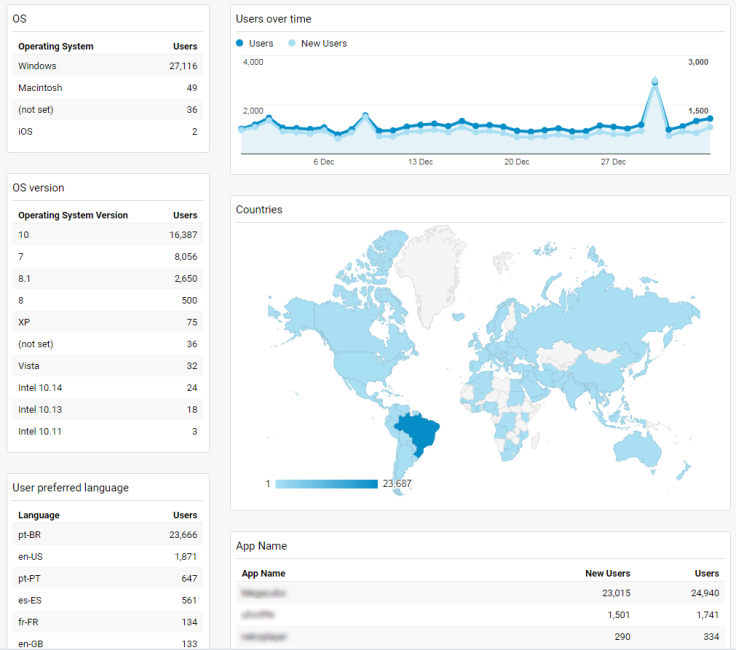 What is Application Analytics, Runtime software statistics? You can read here what application analytics is, why software developers should use it, who are the main providers of run-time application analytics. You can also learn about our free software usage analytics library, SoftMeter that you can use in your Windows, MacOS or IOS software. Usage analytics for software, is the remote collection, measurement, analysis and reporting of the usage patterns of a software product. With usage analytics, software developers can see how many installations their software has, how often and how long their users open the software, which features are used and needed the most, which operating systems and screen resolutions the users have. With this valuable and in some cases real-time information, developers can focus on improving what is important for their users, achieving in this way a superior product, that is produced with less effort and time. How many users have run my application today/this month/any-period-of-time? Is my latest version installed by my users? How many free vs paid installations does my shareware have? What is the geographical distribution of my software? Which software features are most/least used? Which operating systems, OS versions and screen resolutions do my users have? Example screenshot: Number of installs/uninstalls per version of your software, during the selected period of time. Screen resolutions where your software runs. How often do your users run your software? Application analytics dashboard: a quick view to application analytics KPIs. "No relationship can survive without effective and honest communication, and the special relationship that exists between you [the software developer] and your users is no exception. Yet development organizations too rarely exploit the most immediate communication tool at their disposal: their application." Read about the benefits of application statistics on this article by Sebastian Holst. For the success of any project, measuring the results is equally important as constructing it. As a software developer, you must measure the usage of the program you construct. Having knowledge of how much and how exactly your software is used can help you build better software with less effort, focusing on what is important to your users. If you distribute freeware or shareware applications, you need to know how large is your installed base of free (non-paying) users. This will allow you to create and fine-tune your monetisation model and adjust your offers to convert your free users to paying customers. To quickly discover and fix bugs, you need an exception recording mechanism that allows you to collect via the internet the problems that occur on the users' computers. Most application analytics tools provide exception and crash capturing and reporting. Additionally to the exception reporting, when viewing the abandonment rate per operating system or screen resolution you can discover deficiencies of your software under specific environments. We have compiled here a list of application analytics libraries, together with their OS compatibility. There are free and paid solutions, with cloud or self-hosted reporting back-ends. Have a look at SoftMeter. It is an application analytics library for Windows, MacOS and IOS that is very small and easy to implement, having a very simple API.